After the phenomenal win against Mumbai FC and an incredible score of 7-0 in the November 17 match, The Navhind Times Planet J ‘Meet your favourite FC Goa player’ event, which was held on November 18, was an absolute treat to the 198 children and 50 odd parents that were present at the venue. Not only children from the state but even some Mumbaikars were present and shared in the festivities wholeheartedly. The event was open to those in the age group of 12 to 19 but children as young as six participated as well. Decorated with FC Goa T-shirts, flags and streamers in the colours of the team, the venue Dempo House wore a very festive look. Many children as well were dressed in FC Goa jerseys and the atmosphere can only be described as electrifying. Nothing could dampen the spirits of the gathered FC Goa fans not even the delay in starting the programme. By the time the players entered the building, shouts of ‘FC Goa’ could be heard throughout the building and from the road below. The crowd went crazy as the players walked in along with coach Zico, CEO of the team, Sukhwinder Singh and co-owner of FC Goa, Vikram Salgaocar. Some children even got autographs signed and pictures taken during this time. The event commenced with a welcome speech from head coach Zico and was followed by a quiz on the FC Goa team. 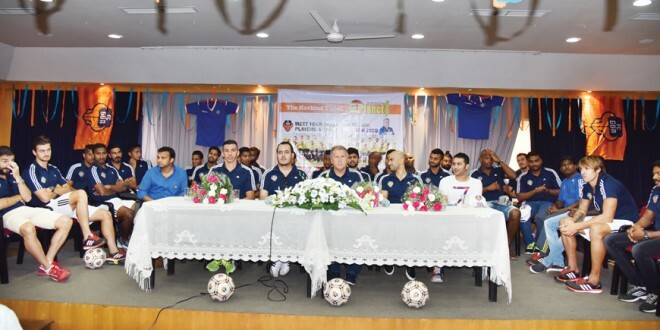 Jerseys with the FC Goa and The Navhind Times logo were given as prizes. The question and answer session with the players was short but some lucky children got their queries answered. A lucky draw followed and the winners got a football which was autographed by his/her favourite player. The meet concluded with a speech of thanks by Vikram Salgaocar as children and parents rushed to the stage to get autographs and photographs taken. Unfortunately, all could not be accommodated but the children were most happy seeing and being with their favourite team and players. The event was awesome! Loved it (except the delay). In spite of waiting patiently for more than 2 hours we could not get either a photograph or an autograph. We were extremely disappointed. It was amazing to be a part of the meet. I enjoyed myself, it was awesome. Thank you so much. I loved it and got to see my favourite player Leo Moura. I even enjoyed the quiz and got a prize. Thank you to the FC Goa team and the The Navhind Times for making this event possible. It was an amazing experience to meet the FC Goa team and players face to face. Thank you The Navhind Times for giving us this opportunity. I thoroughly enjoyed myself and The Navhind Times should have more of these programmes. Thank you. I enjoyed the workshop and interacting with the players. I hope you have more workshops like these. Awesome, awesome and awesome. I always wanted to meet the players and it happened. I loved the quiz too. The wait was too long but finally worth it. Wish we had more time with the team. I enjoyed myself lots and I like Lucio who carried me. Also Mr Singh said I was a brave boy and I got a T-shirt. It was a lot of fun and enjoyed meeting the players. I got two prizes but I wish I had got a ball. The Navhind Times really made the children’s day and they got to see their favourite players up front. Some were even lucky to shake hands and click selfies with the players which they will cherish forever. It was really good to meet the FC Goa players and my dream came true. I play football and meeting the team I am inspired to play better. It was difficult for us as the delay was too much (we had a baby with us) and even pictures could not be clicked. It was really sad that we could not do so but it was a good effort by The Navhind Times. We had a lot of fun seeing the players in front of us rather than on the TV screen. Also the activities that were organised were fun. I enjoyed myself. Thanks to The Navhind Times for this super opportunity and I was lucky to meet the players. I even took selfies with some players. It was awesome, however, my favourite player Keenan wasn’t there. It was a nice programme and I enjoyed myself. I met my favourite player Mandar and I even took his autograph and clicked photographs. It was awesome.